Features: A new French revolution? It can seem like a lonely, thankless task being an international coach at times. Just ask former Ireland coach Eddie O'Sullivan, or any number of former and current England coaches charged with the task of resurrecting the game at HQ. Indeed, to us mere mortals, one could often wonder why many of them get involved in the first place at all. Witness the figure of England coach Martin Johnson, who spent most of the Autumn internationals peering through his hands and you wonder if international coaches aren't a different breed altogether? After two years in the job, France coach Marc Lièvremont is still smiling, but then again he's an almost entirely different breed of international coach to anyone before. Brought in to overhaul an ageing squad after the 2007 Rugby World Cup, the affable 41-year-old former backrow forward has had some notable successes during his fledgling international career. Yet his mid-term report card carries a number of black marks, which could yet wipe that smile off the Frenchman's face. In fact, from a purely statistical point of view, eleven wins against ten defeats suggest a largely mediocre performance as head coach. The high points however, have been top notch. Last year brought wins against the All Blacks and South Africa, an impressive feat in anyone's language so what France lack is not the ability but the consistency required to take their game to the next level. Indeed, Lièvremont may not like hearing it but on the eve of his third Six Nations campaign, he has come to the point of no return. Consistency is a byword for Six Nations success and after two disappointing third-placed finishes in the competition, anything other than a France win in this year's Six Nations could spell disaster for the Dakar-born coach. Luckily for his sake, there is much to suggest that he could well deliver at last. Last season's low point came in the form of a 34-10 hammering against England and boy, was it a low. The French have never been the type of chaps to take a beating from the English on the chin but in many respects Lièvremont and his team haven't looked back since. The ominous June tour came calling yet despite missing a plethora of players due to injury and the Top 14 final, he did what no Six Nations coach has done since Clive Woodward and snatched a precious away win in New Zealand. As an en cours, the superb victory over the South Africans during the autumn series certainly hit the spot. Here was the France that everyone wanted to see - beasting the South Africans up front and played the exciting, heads-up rugby that we know they're capable of. Lièvremont's trick will be getting his young French side to systematically repeat those performances during the Six Nations. Can it be done? 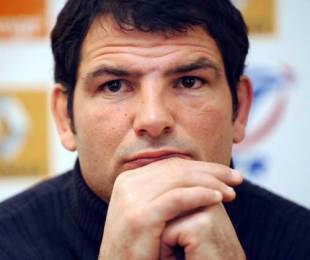 His early days as France coach were marked by a habit of tinkering with team selection yet in recent times he seems to have finally found a core of players that will take him on beyond the Rugby World Cup in 2011. The cornerstone of those victories over the All Blacks and the Springboks was the now tightly knit French pack and it seems the France coach has few worries in this area. One of the team's young'uns, prop Fabien Barcella, looked set to be one of the stars of this year's Championship before injuring his knee on Top 14 duty for Biarritz and will now be out of action for at least six weeks. Another rising star, No.8 Louis Picamoles, is due some big performances in this year's Six Nations while the pack's talisman, the softly spoken Thierry Dusautoir, has a consistency that Lièvremont would love to find in some of his other players. "Lièvremont's trick will be getting his young French side to systematically repeat those performances during the Six Nations." Key worries do remain, however. The search for a credible candidate at fly-half is ongoing with both Francois Trinh-Duc and Lionel Beauxis both seemingly lacking that vital ingredient in being able to grab a game by the scruff of the neck on a consistent basis. The search for a quality French outhalf seems to have been going on since Norman times and it appears that Lièvremont is no closer to unearthing something special than his predecessor Bernard Laporte. One young gun that has had a stellar season so far is Racing Metro's out-half Jonathan Wisniewski but Lièvremont has hitherto shown little interest in the 22-year-old. At scrum-half the absence of Julien Dupuy through suspension should open the door for one of Lièvremont's favourites in Clermont's Morgan Parra but the France coach might also be persuaded take a punt on the mercurial Fred Michalak at the scrum-half position. Michalak has finally started to find form once more under an incredibly patient coach in Guy Noves at Toulouse but his return to the French camp would be a huge gamble. Biarritz's Dimitri Yachvili may have hoped for a recall but he is another to have been sidelined by a knee injury. Lièvremont has decisions to make elsewhere in the backs, where he will have to make do without the talented Perpignan centre Maxime Mermoz for a significant portion of the Six Nations. Damien Traille, who has enjoyed something approaching utility back status under the French coach was in line to deputise in his absence but will miss most of the Championship with a knee injury. There have been returns to form for Clermont Auvergne's powerful wing Julien Malzieu and Toulouse's Vincent Clerc so they will be expected to figure during the tournament. With both Ireland and England due to visit the Stade de France this year, and with Lièvremont's squad maturing nicely, there is very reason to suggest that this could be France's year. In fact, given the resources, the players at his disposal and the calendar, the 2010 Six Nations will be deemed a catastrophic failure should there be anything other than a France win. Your time has come Monsieur Lièvremont!